Tonight’s indicative votes has strengthened the government’s view that the PM’s deal is the best option. After the option for the second referendum did not get enough support any deal must include a withdrawal agreement. Boris Johnson has revealed he will back the prime ministers deal in order to get her out of no 10. The List of eight amendments that will be put to a vote. MPs have voted to take control of today’s parliamentary business. A series of indicative votes to show their preferred options for Brexit will follow this evening. The Speaker, John Bercow has selected eight options. The measures being debated include leaving without a deal, forming a customs union, Norway style or customs 2.0 and a confirmatory referendum. Theresa May is still trying to drum up support for her deal, despite it being voted down by a large margin twice. The Speaker of the House reiterated his earlier warnings that the PM’s deal could not come back for a vote if it had not significantly changed. Labour has confirmed it will be backing a motion calling for a confirmatory public vote, saying any deal agreed by Parliament “needs further democratic approval”. If the PM loses she will have to go back to the EU with the new set of conditions. How will the EU respond? Donald Tusk has said the EU must not betray the 6 million people who signed the petition or the 1 million who marched in London on Saturday. Nigel Farage has asked the EU to just kick us out on 12th of May, irrespective of what happens to the UK afterwards. 73 MEP’s are working on overtime from Friday onwards. Westminster’s Brexit business will run a little differently Wednesday. Off the back of voting on Monday night, UK lawmakers voted for an amendment put forward by Conservative MP Oliver Letwin, giving them control over the parliamentary timetable on Wednesday. Plans for how voting would unfold were outlined in Letwin’s Business of the House motion. Power transfers to lawmakers at around 2:00 p.m. with House Speaker John Bercow making a selection of the tabled motions an hour or so later. Labour MP Stephen Kinnock says he’ll be voting for a Norway-style arrangement with the EU. “I’ve been completely consistent for the last two and a half years. I’ve been campaigning for the Norway option. Belgian MEP Philippe Lambert slammed British Prime Minister Theresa May during a press briefing in Strasbourg on Tuesday. Anti-Brexit British voters who want to remain in the EU must not be “betrayed”, the president of the European Council has warned. I’m a great believer in petitions so when asked to sign the online one calling on Theresa May’s government to revoke the Article 50 notice and ….. The PM does not see the Brexit process as a failure, she would see remaining as part of EU a failure. 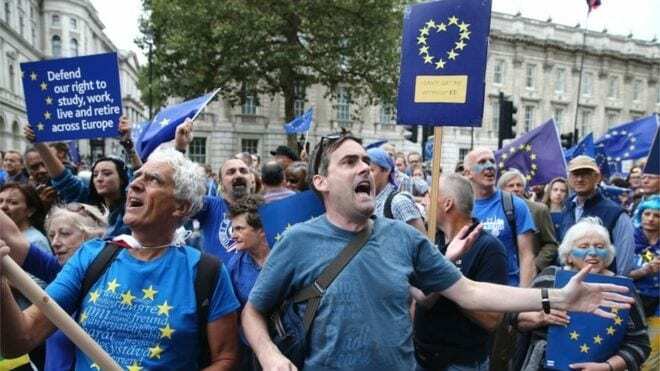 British MP’s have seized control of the parliamentary timetable for a series of “indicative votes” on the next steps for Brexit – but Theresa May has not committed to abide by the outcome. The House of Commons passed by a comfortable 329 ayes to 302 noes an amendment led by the Conservative former minister Sir Oliver Letwin which provides for a series of indicative votes on finding a consensus Brexit solution. The PM lost three ministers who resigned. At least 16 Brexit proposals have been submitted by MP’s for “indicative votes” in the Commons today. The Speaker, John Bercow, will select the options to be debated. In a bid to break the Brexit deadlock, lawmakers in the UK Parliament have handed Theresa May another defeat. MPs have decided to try to break the Brexit deadlock by holding a series of “indicative votes”. But what does it mean? The government has become the laughing-stock of Europe. What week it has been, The Prime Minister has spent the weekend in Chequers, trying to make a deal even bargaining with her future. It Is understood that Boris Johnson was at this meeting and he wanted assurances that the Prime Minister would resign before choosing a side. Here are a few of the best articles from today, to catch up on what you may have missed. We’ve also added a few articles from European media to give you an idea of what the EU think of our shambolic Brexit. Oh and BTW way we have handpicked the articles … we don’t trust auto feeds and RSS content when it is this important. Hover over the pictures and you will see the name of the publisher as well a snippet of the article. The two-week reprieve granted by the EU means that as things stand, this becomes the new legal date for the UK’s departure from the bloc under EU law.